Living with Nyarlko can tire you out. No episode of Nyarlko this week, but we have Episode 6 from last week to talk about! Last we discussed, Kuuko is trying to convince Kuune that she is engaged to Mahiro, much to the unhappiness of, well, everyone. So come with me and Fosh and see how that’s turning out! Welcome back to more Haiyore! Nyaruko-san on Metanorn with me and Highway! Soooo what is going on this time in this hilarious series lately? It seems to be more of the same lately for me, but thankfully with the addition of Kuko’s cousin joining the cast which seems to have added some much needed excitement to the series for me! Anyway I hope you enjoy the review. Mahiro and Kuuko can’t catch a break. While their act isn’t enough to convince Kuune that they’re lovers, it’s more than Nyarlko can take, and we end up following everyone on a date to prove that they are really engaged. The only one who’s taking it at face value is Mahiro’s mom, and she spends the whole episode reminiscing to Hastur and Shanta about her engagement to Mahiro’s dad. And I have to give Kuuko credit, she’s actually pretty cute on this date. It really seems like her feelings that were exposed at the end of the last episode are building, that she ‘doesn’t dislike the boy’. Nyarlko just can’t handle it, tho. First she tries to get Mahiro to stop pretending on his date with Kuuko, and when that doesn’t work, she confronts him in his room. She’s even losing her confidence that she can even win Mahiro, even though she loves him (and is the main heroine, so she’s supposed to win). And even though her sadness moves Mahiro to be nice to her, he still doesn’t know how he really feels about her. The biggest problem is still the same one: She doesn’t have a variable control. She’s all on or all off. And even the littlest bit of capitulation on Mahiro’s part, saying that he doesn’t hate her, brings her back to declaring that he’s acknowledged her love. If she’d only tone it down just the littlest bit! I think I sound like a broken record when I say “this series is lacking in the anime references department” because it is TRUE! Lately it seems to be a mixture of both Kamen Rider and Cthulu based stories (thanks NyaruReferences again) I almost feel like the producers are trying to move away from the use of anime references, but I love that quick scene with Cthune randomly wearing an eye patch while shouting the line about “Synapse, burst open!” from the popular Chu2koi series! Besides that one we had stuff from Index, Death Note, Space Battleship Yamato and of course more Jojo’s bizarre adventures. So there you have it for episode six and you can kind of see what I mean with the lack of anime references, but I just hope I have stuff to write about as we inch closer to the end. Not a bad episode this week even though I want more comedic moments and anime references to watch out for; however I think the series is shifting gears and heading for romance developing between Mahiro and Nyarlko and recently a surprise love triangle has appeared that is hinting towards Kuko and Mahiro? 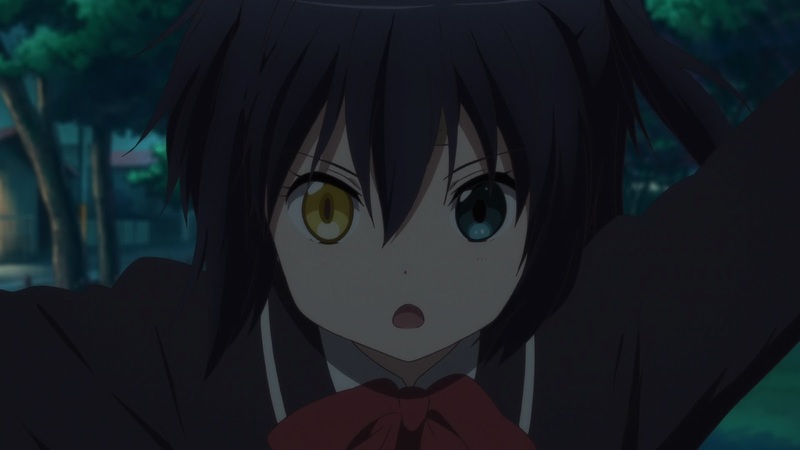 Personally I don’t really care all that much for the love aspect of Nyarlko-san because I will always see season one and this current season as comedy instead of romance, but I will say it is a lot of fun watching Mahiro and Nyarlko together, I just want SOMETHING to happen between them soon. So close and yet so far. While I like the idea that Nyarlko and Mahiro might get together, Nyarlko’s stubbornness in realizing what Mahiro wants – not craziness – is something that’s as likely to push him into Kuuko’s arms as anything else. Meanwhile, Kuuko’s starting to get more and more of those happy smiles, something we’ve never really seen before now. Is she really falling for Mahiro? And what would that do to Nyarlko if she were to openly declare her love for him after Kuune leaves and she doesn’t need to pretend anymore? And I guess that we’re not going to get any more of Tamao after all? There doesn’t really seem to be much room for her in Mahiro’s life, but the only way for there to be would be for her to make the room. Seems like a lot of choices that Mahiro doesn’t want to make. Hi. I know I get possessed/time/body switched with things that look like broccoli should never ever look. But if you ever need something more normal, I’m here for you. Yeah, she could make the room. I said this last time, of all the forms she could take, to visit all the wonderful places in the entire universe, she chooses one form, one planet, one guy. That’s pretty amazing. But you get all or nothing. 1% less Nyralko is not Nyarlko. And I think that might be a lesson both of them can learn. Oh, but Kuuko. She started to look at him end of last season, and I’m glad they are starting to play with that some more. It really does make the story that much more interesting. Now, if they can only starting treating Hasta-kun less like baggage, all will be well. So is Nyarlko doomed to be Mahiro-less then? It would seem that is her possible choices: Be who you have been and never have the love of your beloved, or make what I think is a minor change and win his heart. Of course, that’s my estimation of what level of change it would be. Perhaps for her it is impossible. But the way I see it, her insistence on what she’s doing is driving him into Kuuko’s arms. The only way Hasta would be less baggage-y would be a situation like in OregaIru, where Mahiro finds him attractive, even while knowing he’s the wrong person to be in love with. Honestly, I think that’s my favorite plot device this season. Yeah, she could dial it down, but those upper levels will always exist. Given that this is primarily a pop culture comedy I doubt we will see a resolution during this run. Status Quo is God. Never underestimate the hidden talents of a harem lead. His prowess is so effective he can even breach yuri fields. For a supposedly fake date, it all felt real and serious, something I admit wasn’t expected. It didn’t seem like Kuuko was acting anymore. With that “I don’t dislike him” statement last time, it’s obvious she’s falling for him. Something would have been really wrong if Nyaruko wasn’t in despair. 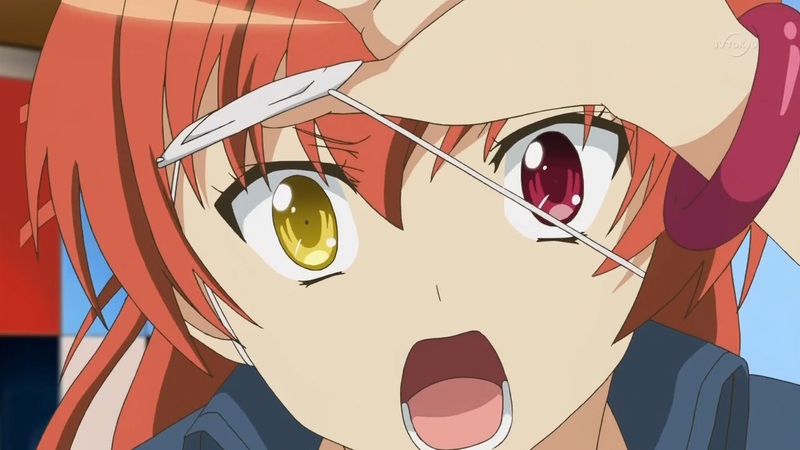 Nyaruko’s breakdown is understandable. At first, Kuuko was a just a minor main character but now she’s becoming a credible candidate to be with Mahiro and a threat to everything Nyaruko hopes would come true. Losing to a rival is bad enough but having the rival being your supposed sworn enemy is adding insult to injury. The biggest problem is that in mannerisms, she and Mahiro are as different as day and night. He’s quiet and goes with the flow while she’s a wild child and apparently neither side wants to compromise themselves. Not to mention that at the beginning, he was pretty much a loner. He wants to like her but not at the cost of uprooting his entire life so he holds back. The episode last season at the shrine during their “date” indicated as much.